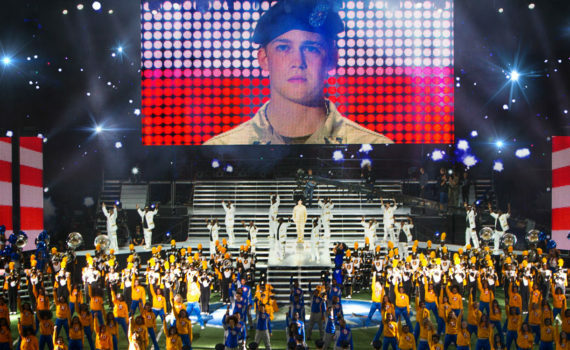 The most disappointing film of the year is legendary director Ang Lee’s modern war perspective piece, Billy Lynn’s Long Halftime Walk. Long title, that’s for sure, but unfortunately it wasn’t very long between when Billy Lynn came out and when it completely bombed. It was the undisputed Oscar frontrunner as soon as it was announced, looked to be the solid #1 no matter what else came out, but then completely tanked as critics and audiences actually sat down to watch it. It ended up not even being near the Oscar conversation, instead fading into the background along with every other movie that had high hopes but lacked the greatness to achieve them. Young solider Billy Lynn and his Bravo Squad have just become American celebrities after a video of a daring mission goes viral and the media picks up on a story of heroism in the face of such danger that makes the war seem at least slightly more appealing. Now on a victory tour before they are sent back overseas, Bravo must withstand the scrutiny of the cameras and the populace as they are made into a spectacle rather than a true story. Their last stop is to the halftime show of a major sporting event, where they will be on stage to be honored and to perform with the musical act. This isn’t what they signed up for, and for Billy, it’s only an added stress, another annoyance, and a reminder of what he went through so recently, something that has been so trivialized that it has lost all its meaning. The truth is, Billy Lynn deserves the abuse it gets for being so highly touted yet so utterly abysmal. It not only fails to be one of the best of the year, but actual should be considered one of the worst, as it unintentionally falls on its own sword early on, never recovers, and ends up as a terrible film through almost any filter you want to judge it. The acting is pathetic and awful and embarrassing; Alwyn the amateur, Hedlund the awkward, Stewart misplaced, and a supporting cast in Vin Diesel, Steve Martin, & Chris Tucker that’s utterly cringe-worthy. Every scene is over-directed, over-saturated with false feelings, and the entire story feels force-fed until each of us is choking on something disgusting. It’s more The Replacements than Brokeback Mountain, with fake sports teams, D-level plot structure, and a general feeling that something critical went terribly wrong. The only saving grace is the critique of our hero culture, of our desire to applaud soldiers without actually taking care of them, of how war can so quickly become a piece of the giant propaganda machine. The message is there, I applaud what Lee was trying to vocalize, but he completely failed in his attempt to say it in a movie.